The Acer XB252Q aims to provide cutting-edge performance with its 240Hz refresh rate for fast-paced action and G-Sync for buttery smooth visuals. The package comes with Acer’s signature Predator treatment designed to give gamers an idea of what this product is capable of mixed with modern touches and functionality. From the get-go, the Acer XB252Q should make it to your dream rig list, but how does it stack against its established competitors? The Acer XB252Q inherits its hot looks from its predecessor, the Acer XB241H, but it now features a more minimalist aesthetic. It leaves behind the red accents which were tacky for some, and instead, went with a full matte black scheme which looks cleaner. The screen is almost bezel-free in this iteration, although there still are panel borders as expected. Don’t worry since the thicknesses are still within reasonable limits, with the top and the sides are only 7mm each, while the bottom is at 21mm. The positive side here is that the inner borders on the panel itself look thinner, giving you that clean and unobstructed look. 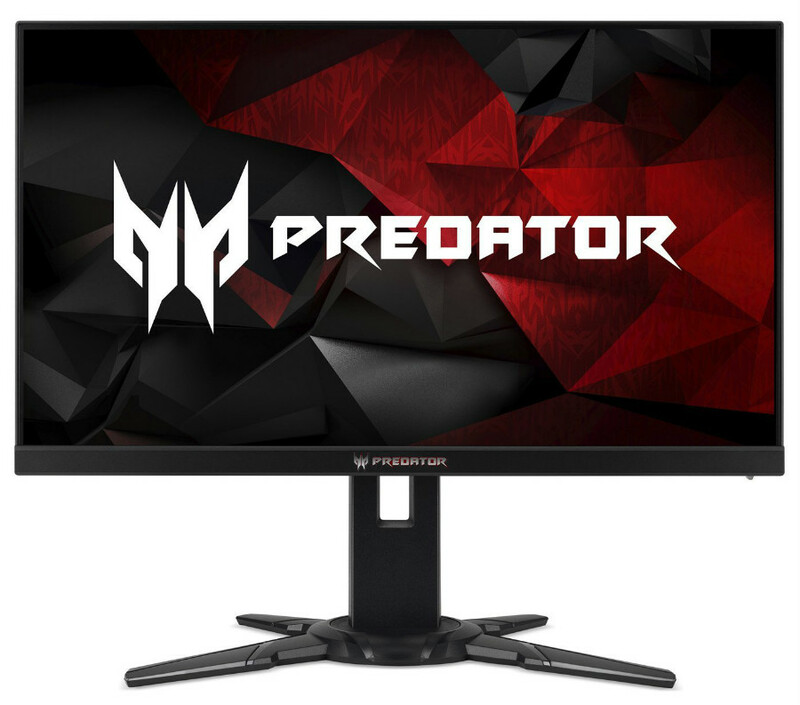 Frankly, if it weren’t for the Predator logo, the Acer XB252Q can look like it is disguised as a typical office monitor. 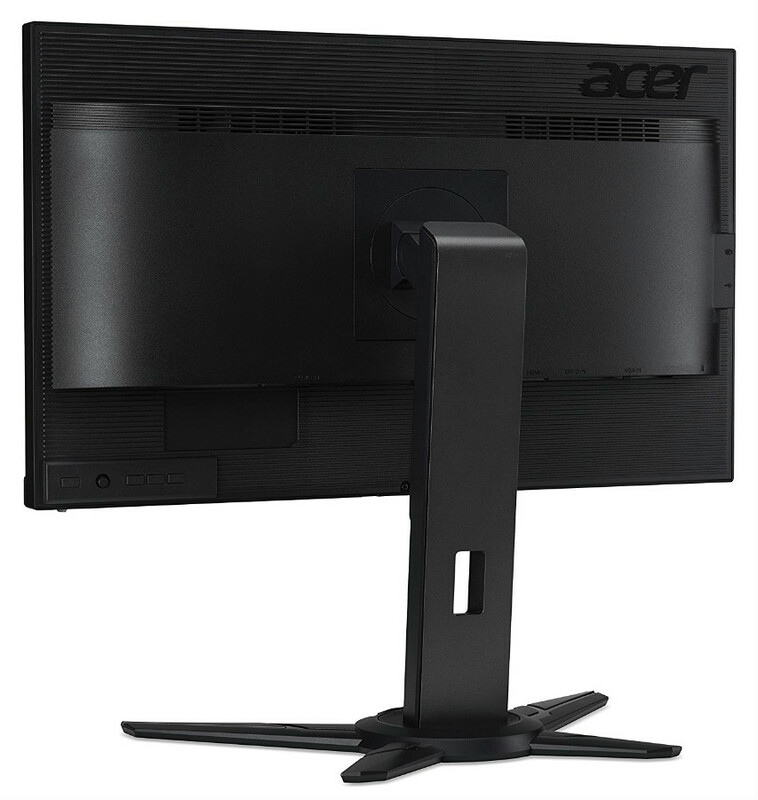 The dimensions of the Acer XB252Q are within acceptable standards as well, thanks to its thin side profile and a slightly protruding bulge. 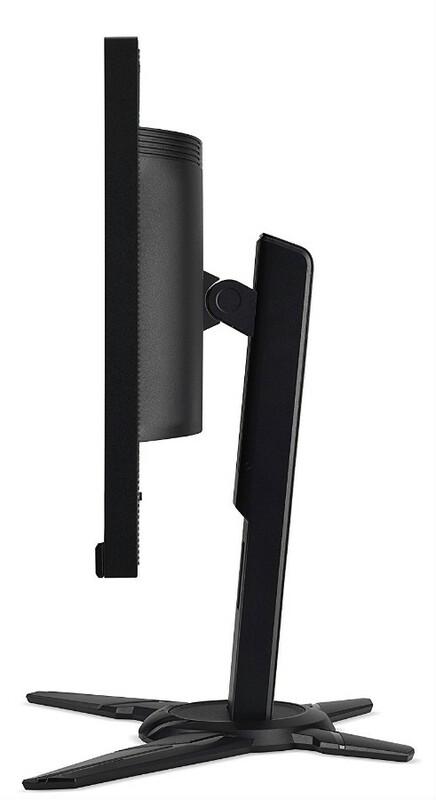 This gaming monitor can easily be flush mount thanks to its modest dimensions, but doing so would waste the full-featured stand. The ergonomics allows height, swivel, pivot, and tilt adjustments, so getting the perfect angle to avoid TN panel issues is easy with the smooth, but firm movements. What we don’t like about the Acer XB252Q is its X-shaped base since it takes up more or less a square foot of a desk to keep the product upright. Don’t get us wrong, build quality is excellent and the choice to go all black is superb, but we reckon a monitor of this size would stand stable with a smaller base. What’s positive about it though, is it has a metal core which adds sufficient heft and durability to the product, plus, we did not notice any unwanted movements or flexing during our test. Since the Acer XB252Q is equipped with a G-Sync module that limits its I/O layout, the only video input options included are DisplayPort 1.2 and a secondary HDMI 1.4 slot. However, owners get five USB 3.0 slots for convenience, with two receptacles placed in a hub located on the left side. All the OSD controls are also located at the back, with four buttons including the power switch and a joystick for easy OSD navigation. A pair of built-in speakers with 2 watts of powers each sit near the top of the bulge, but both do not have enough power to convey the audio games provide. You can connect a decent aftermarket set to the Acer XB252Q’s 3.5mm jacks for easy cable management. The Acer XB252Q sports a 25-inch TN panel with a 1920 x 1080 resolution, 240Hz refresh rate, and 1ms response time. The specs list are similar to competitor models like the Asus PG258Q since these models share similar modules from AU Optronics. What differentiates this model is it has a higher brightness output which can work both ways. For one, the overly bright screen had some adverse effects on Gamma adding a noticeable deviation which created a minor washed effect and induced grayscale errors. Thankfully, a contrast ratio which averages at 850:1 holds down the imaging performance of the Acer XB252Q. These small imperfections shouldn’t matter when gaming, but the biggest issue here is the minimum brightness which felt too bright for darker rooms. On the other hand, colors are vibrant enough since the Acer XB252Q has a 98.5% coverage of the sRGB color space. A Delta E average of 2.5 is almost below average when compared to similar monitors, but this score is due to some minor oversaturation in some shades. The screen has a slightly warm tint even after tweaking, but this was only noticeable on white surfaces. The positive side of having a higher brightness threshold helps the Acer XB252Q when users engage the ULMB mode. Typically, using backlight strobing darkens the screen too much making it unbearable for some due to decreased visibility. At least on the Acer XB252Q, this wasn’t such an issue, although we still prefer using it without ULMB since the refresh is fast enough to avoid blurring. For graphics-heavy titles, the Acer XB252Q comes with G-Sync to smoothen out games and cure tearing. Even if you have a GTX 1080Ti in your rig, newer games like Destiny 2 still won’t maximize the 240Hz threshold. For cases like this, enabling G-Sync should be your first choice, but keep in mind that the VRR tech only functions from 30Hz to 144Hz. Be sure to lock your framerate if you can within that range or else V-Sync will take over and induce latency. Finally, the Acer XB252Q is a fast monitor with an input lag of only 6.5ms, putting it in the middle of the 240Hz pack when it comes to delays. Despite clocking in at a slightly slower rate, we did not notice a difference in responsiveness when compared against the Asus PG258Q. The only real aspect to base your choice on is aesthetics, where the Acer XB252Q has the advantage for fans of minimalist designs. The Acer XB252Q has minor flaws, but it still is a fantastic gaming monitor in the G-Sync equipped E-Sports display category. Take our slight misgivings with a grain of salt since it practice, the differences between this killer device with its competitors are negligible. Like most monitors, this model still requires some time and effort to tweak or calibrate to get the most out of it, and once that’s done, you will have a winner on your desk. The only downside to monitors like the Acer XB252Q is that G-Sync loses its usability once you have a system powerful enough to get close to 240Hz. If you do have a mighty gaming rig, maybe you should consider a 1440p or even a 4K gaming display for more or less the same price. hi, i have a dilemma between this or xb241h. i have 1070. my fps usually around 80-100 fps. some people told me its not good on 240hz if fps is around that. Hello, Mizi! Practicality-wise, the Acer xb241h would offer the best dollar per performance due to its reduced price. However, the Acer XB252Q provides a bigger headroom and is more future-proof unless you consider higher resolutions. Both will do fine with your GTX 1070, so get what is best according to your taste and budget. Cheers!